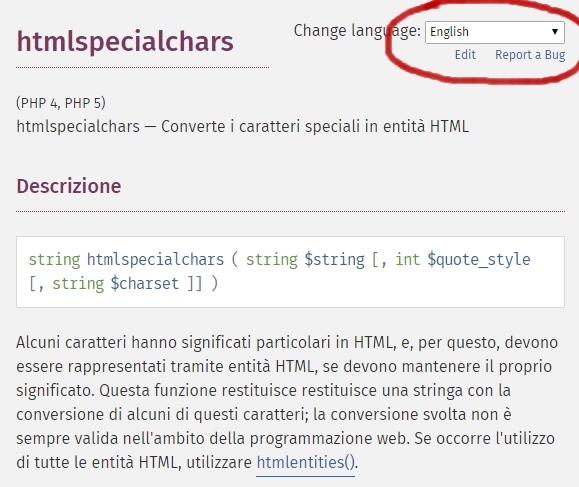 Italian translation of the php.net website is literally embarrassing. some pages are just too old to be useful to anyone and they just cause a lot of confusion to PHP newcomers. The checked <option> is English but the page is actually in Italian, so I need to switch to another language first and then switch again to English to get the actual English version. I'd suggest to either disable the Italian translation entirely, or fix the <select>box's behavior. part of the problem you've described should be solved after next sync. You'll be able to select other language in one click. We still host those inactive translations on main php.net site, but I think that it's going to be fixed soon. the Italian translation is still pending.